We are surely past the era when a sturdy steel cupboard of grey or brown color would sit in every Indian bedroom catering to all the storage needs. 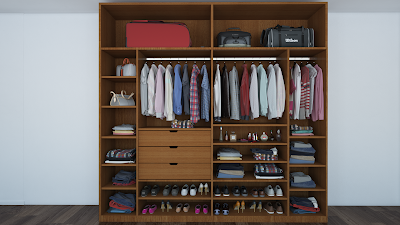 Now wardrobes don’t just store your garments, but they are important part of the whole furnishing scheme where every piece comes together to define your home. Therefore, you need to select the wardrobes that look chic yet provide good storage capacity for your apparels. Particle Board: This comprises of wood chips glued together and pressed to form sheets. It bends well because it has low density and weight, so it can be used well when making long panels for wardrobe doors spanning nine-feet. If you use it correctly the overall furnishing cost can be greatly reduced as the price of this material is cheap when compared to MDF and plywood. This is a good low cost option for wardrobes and other furniture that is not exposed to a lot of moisture. MDF : Medium-Density Fibreboard (MDF) is an engineered wood pulp, made by breaking down real wood remnants into wood fibres. It is then glued using special resin and by applying high pressure and temperature. It is cheaper than plywood and it’s a good option to particle board as it is stronger and more durable than particle board. Its surface is so smooth that knots will not develop and it is ideal for painting and other flat furnishing products. This is ideal for wardrobe shutters. Being consistent, its edges remain smooth without any splinters or voids. Boiling water proof Plywood: This is the costliest of all the above materials and it has high resistance to water exposure, in fact much better than solid wood. This is highly durable and can withstand severe temperatures. It is also Borer and Termite-free. If your wardrobes are used roughly and exposed to moisture, plywood is the best option. However, since wardrobes are not normally exposed to moisture or water, MDF would be a good choice for a wardrobe shutter while the body can be of plywood or particle board. Size and cost of the wardrobe are co-related to each other. As the size increases, the price of the wardrobe also increases. However, the price variations you usually see in the market could be because of the depth of the wardrobe. 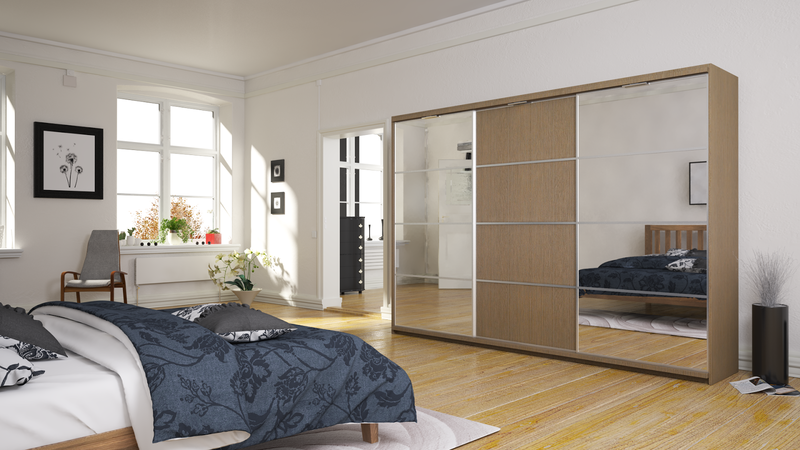 Most of the furniture makers manufacture the wardrobes at 18 inches depth to cut down the cost of the wardrobe. However, it’s advisable to have the wardrobes with a depth of 24 inches, as you get more space for your things, and the wardrobe also looks more elegant. However, 18 inches could be the best option if you have more shelves and less drawers and hangers. It’s always advisable to double check what the depth of the wardrobe is before you buy it, to have a comparison of prices. Wardrobe door types play a significant role in determining the price of the wardrobe for the same dimension and depth. For instance, a 6 feet width and 7 feet height particle board wardrobe costs around Rs. 24,747, while the sliding door costs Rs. 33,985. The around Rs 10,000 difference for the sliding door is because it requires lot of hardware mechanisms like rails, wheels and channels which add additional cost to wardrobe. Also, in the sliding door wardrobe the material waste is higher than a full panel. However, the sliding doors look more elegant and stylish than full panels. Customize the interiors and hardware exactly the way you want it, by paying for exactly what you want. Buying a ready made wardrobe from anyone is not so advisable if you’re unable to customize the interiors and hardware, because you end up paying extra money for things that you do not require and also it may not fit your requirement. For instance, you require an 8 inch drawer which costs roughly Rs. 2,310 (plywood), in the same 8 inch space. If you go for two 4 inch drawers, the cost of the drawers will double as two 4 inch drawers cost roughly Rs. 3,880 (plywood), because two drawers will need to have 2 handles, two pulley mechanism hardware, which results in lot of material wastage. It is nice look. Steel Cupboard is designed for the ambience of the classrooms, different types of institutional furniture like white board and green board. Nice and informative post. I really appreciate your valuable point. Thanks. And also, check this how to design and customize your two door wardrobe designs with shelves, drawers etc.